Summary: Oil painting showing a large, busy gathering of people in front of a church. To the left is a stall where a family are trading. There is a large stage where a performance is taking place. Description: John Faed's father was a millwright. 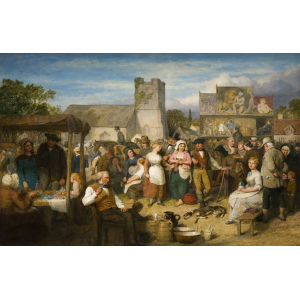 He married the beautiful Mary McGeoch and in 1819 they settled in the Scottish town of Gatehouse-of-Fleet, where they had six children, four of whom, John, James, Thomas and Susan became accomplished painters. All the children attended the local Parish School. John Faed's first drawings were displayed in the mill and a local woman suggested that he exhibit them in shop windows to earn some pocket money. He was barely nine years old when he first began painting miniatures of family and friends but really he wanted to paint on a grand scale. He studied art in London and then in Edinburgh. He was soon receiving commissions for his miniatures, which bought him financial security and enabled him to work on larger oil paintings. 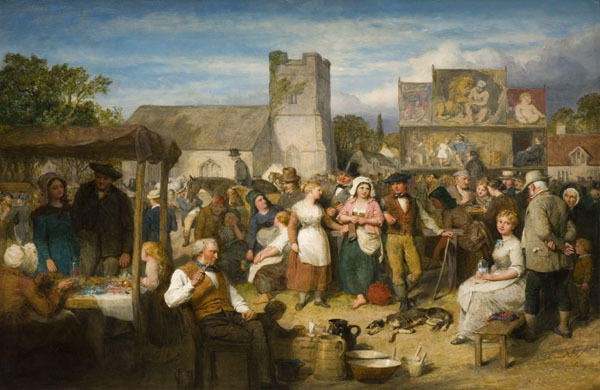 John Faed's success as an artist coincided with a growing interest in the culture and romantic tradition of Scotland.